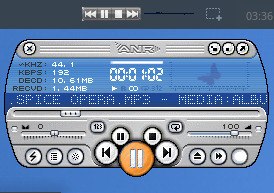 Description: Screenbar module plug-in for AmiNetRadio by Philippe 'OffseT' Rimauro. Requires: MorphOS 3.10 or better, AmiNetRadio, MagicBeacon (optional). such as the screenbar modules. screenbar module, displaying a small scope and all the desired control buttons! notified to MagicBeacon to display some nice bubble or whatever you want! automatically brought to front at startup when needed. - Specify the list view & mode for hyperlinks related to files. - ScreamBar can now be used as a (smart) launcher for AmiNetRadio (eeek!). - Added middle mouse button on equalizer to bring AmiNetRadio to front. - Now HIDE then SHOW AmiNetRadio to bring it to front anycase. than the screen bar itself. ScreamBar will bring it to front. - Fixed AppIcon to use ScreamBar executable icon. 1. Copy the ScreamBar executable into the "plugins" drawer of AmiNetRadio. drawer if you want to create additional ones). (display a bubble with the message "Now playing: %m" could be a good idea). Launch directly ScreamBar and it will also launch AmiNetRadio for you. Launch AmiNetRadio and start the ScreamBar plug-in from the "Visual Plugins"
about the currently playing media. the currently playing media, and optionally quit ScreamBar plug-in. be wrong at some point. and/or AmiNetRadio should be fixed).